The victory of a center-right coalition in September’s parliamentary elections has all but settled any doubts about Slovakia’s future economic and geopolitical orientation. But even if membership in the European Union (E.U.) and NATO now seems a sure thing, the new government may prove too fragile to fulfill international commitments or to deliver on domestic promises. The strains are already showing. 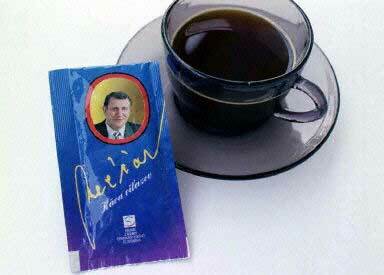 "Meciar: the coffee of winners" is written on an instant coffee-bag named after Vladimir Meciar, the leader of the Movement for a Democratic Slovakia (Photo: AFP). Mikulas Dzurinda again secured the prime minister’s seat. His Democratic and Christian Union (KDHU) won 15 percent of the vote, taking second place to the populist Movement for a Democratic Slovakia (HZDS), which got nearly 20 percent. As it did four years ago, the KDHU joined with other parties to block HZDS from taking power. As prime minister from 1993 to 1998, HZDS leader Vladimir Meciar pursued an incoherent foreign policy whose sole success was to isolate Slovakia and to keep it out of the first round of NATO expansion in 1999. Echoing KDHU’s election program, Dzurinda has identified the new government’s four main goals: Slovakia’s integration into the E.U. and NATO, trimming and improving the state administration, fighting corruption, and integrating the Roma (Gypsy) population into society (Sme, Nov. 6). The new government, however, is quickly discovering how difficult it is to cut fat while maintaining services. Meanwhile, the HZDS’s second defeat despite a technical victory is prompting soul-searching among the party faithful. “The idyll has ended” is how Jan Jasovsky, a deputy representing HZDS, described the atmosphere in Parliament on Nov. 6, during debate on a package of budget laws (Narodna Obroda, Nov. 7). Nevertheless, the legislation, which calls for cuts in social spending and tax hikes, passed the first reading. Complaints by HZDS deputies and representatives of SMER, another populist party, that the budget would cause more harm than good, fell on deaf ears. Finance Minister Ivan Miklos asserted that the Slovak National Bank and international experts supported the government’s budget and that plans to join the European monetary union by 2006 depended on corresponding legislation. Earlier this year, an E.U. official declared that the high level of corruption in Slovakia was a key concern regarding Slovakia’s joining the community. Daniela Zemanovicova, program director for Transparency International Slovakia, told Narodna Obroda that points in the government’s anti-corruption program were incomplete or not explicit enough (Nov. 7). For example, it does not cover the financing of political parties. “The parties will only do what the public, the voter, forces them to do. And as the elections have shown, this is a problem area. Public pressure has to develop in order to change this system.” Political scientist Juraj Majchrak, interviewed in Sme (Nov. 5), said that a law on conflict of interest was key. In his view, the current declaration is more persuasive than the one issued by the last government four years ago. As for the country’s Roma minority, the government remains in search of a policy. One plan, put forth by coalition partner ANO, calls for setting up communities like Israel’s kibbutzim and a new office for Roma affairs in Kosice, a city in southeastern Slovakia (Sme, Nov. 6). Experts have rejected the plan as amateurish.